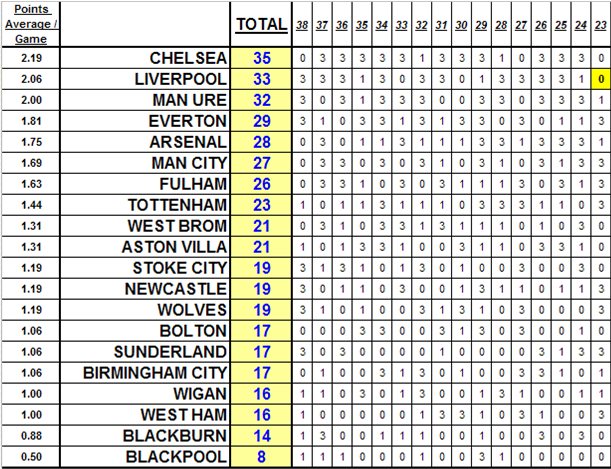 Many Liverpool fans have remarked that they have never known a season like 2010/11. Indeed, it has been a season of downs then ups like no other in the memory of most fans. To find a season that resembles the current one, we have to go all the way back to the late 1950s. In doing so, hope turns to excitement at the prospect of history repeating. In the summer of 1959, Liverpool were a club with a relatively glorious past (five league titles) who were languishing in the second division and in steady decline. They had a stadium that was not fit for purpose and a squad full of untalented and unmotivated players. There was some promise for the future, with a 17 year-old Scouser called Ian Callaghan bursting into the Liverpool team, but on the whole it was a depressing time to be a Liverpool fan. After an unsteady start to the 1959/60 season manager Phil Taylor resigned, citing failure to return the club to its former glories as the reason for his departure. He said at the time, “I set my heart on it and strove for it with all the energy I could muster. Such striving has not been enough and now the time has come to hand over to someone else to see if they can do better." The man who was called on midway through the season to galvanise the club was a Scot by the name of Bill Shankly. On being appointed, Shankly said, “The fans deserve success and I hope, in my own small way, I am able to do something to help them achieve it. I make no promises except that from the moment I take over I shall put everything into the job I so willingly undertake." One of his first games in charge was an FA Cup Fourth Round tie against Manchester United, a game which Liverpool lost. However, the second half of the season represented a turning point for the club. Shankly’s Liverpool, buoyed by a new and exciting training regime, started to give the fans something to smile about again. 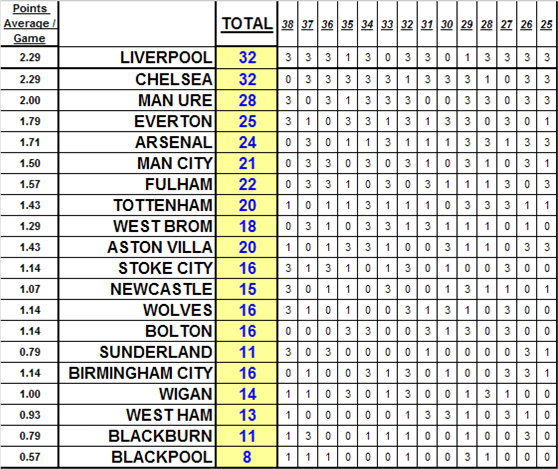 Of the final 19 games, with a renewed sense of togetherness, Liverpool’s record was W11 D5 L3. Liverpool finished the season in third place, one place short of promotion to the First Division. It was clear that the rebuilding program had begun. The parallels between 1960 and 2011 are clear to see. As we began 2011 Liverpool had a stadium not fit for purpose, we got knocked out of the FA Cup by United and our manager was incapable of getting the best out of his players. Much like 1960, local teenagers are bursting onto the scene. The fact that Ian Callaghan went on to become a World Cup winner and our record appearance maker should inspire the likes of Flanagan, Robinson and Kelly who all have the potential to play their way into the LFC folklore of the future. Another parallel is how we fell just short of the position that would have catapulted us back into the big time, despite a great second half to the season. For the promise of glory, the most exciting comparison is between Bill Shankly and Kenny Dalglish. There is a genuine feeling that January 2011, just like December 1959, will be seen as the moment when Liverpool FC was reborn. As the season draws to a close, just like in 1960, we can look ahead with hope and optimism. We have a charismatic Scottish leader, a man of the people, uniting the club and reigniting the promise of a glorious future. It took a further four seasons, until 1963-1964, for Liverpool to clinch their sixth league title and their first of the new era. Let’s hope that, should it take four years again, everybody connected with the club has the same faith in Kenny as the people had in Bill. The below table shows the league table for the 16 Premier League gameweeks since Kenny Dalglish took charge of Liverpool. Liverpool are currently averaging 2.06 points per game. 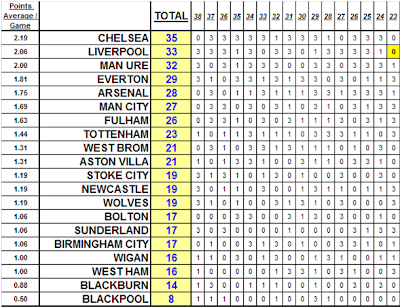 Extrapolated over 36 games, we would be sitting on 74 points, 2 behind United's current league total. This all bodes very well for next season, especially if you take into account the promise of big money signings over the summer and the benefit Liverpool will feel from a full pre-season under Dalglish and Clarke. In looking at our prospects for the remainder of this season, based on Tottenham's slide (they are 13th in the form table based on the last 10 matches!) and Man City's recent dip in form, 5th place is a realistic possibility and 4th place, whilst unlikely, is by no means impossible. The last two games of the season will bring excitement we could not have imagined in January and the 5 years some pundits speculated it would take us to return to the heights of 2009 is looking more like 5 months with every passing game.